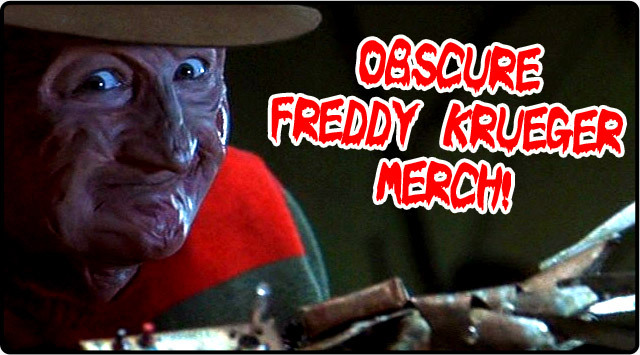 Obscure Freddy Krueger Merch! | Dinosaur Dracula! Without meaning to, I’ve amassed a pretty diverse collection of Freddy Krueger merchandise. I guess the best explanation is that it’s very easy to do. Especially in his heyday, Freddy Krueger really stood apart from his slasher brethren on the merchandise front. His steady evolution into a killer comedian made him a much safer bet than, say, Michael Myers or Jason Voorhees. Freddy’s probably had ten times more toys and novelties than those two guys combined! Since I’m more prone to notice the horror-related bric-a-brac peppering my many shelves during the Halloween season, I thought now would be a good time to give some of my “Freddy junk” a day in the sun. 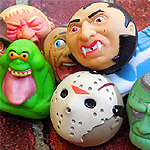 Here are five of my favorite – and most obscure – Krueger collectibles. “Character Cars” were standard-sized Matchbox cars with a twist: Each was topped with a movie figurine. The collection was surprisingly sprawling: Aside from Freddy, Jason and Leatherface, there were others based on the Universal Monsters, and even a few with non-horror characters. The only downside is that you can’t remove the figure. I mean, you could, but it’d only ruin both the figure and the car. As great as it is, I think it’d be more interesting to shuffle a NOES van into a pile of regular Matchbox cars. God knows, that pile could use some personality. I wrote about this almost ten years ago, and it should surprise no one to learn that I’ve kept it ever since. 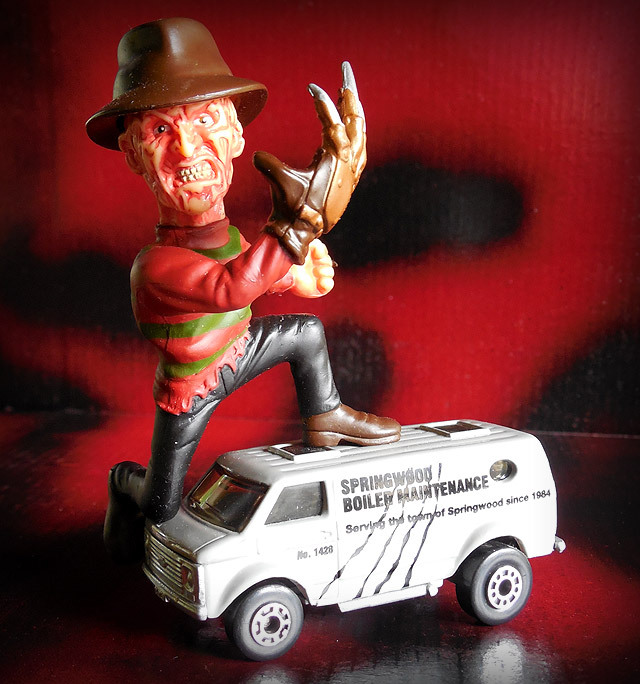 It might be the most bewilderingly harmless Freddy Krueger collectible of all! That was more than made up for by the awesome “tube” packages. Freddy’s claw rising through a pile of gum is a sight I love like few others. The one thing I’ve always been confused about is that line circling the sticker. “The Freddy nobody knows?” What does that mean? Was Topps implying that he had a softer side? If so, they chose the right photo. That’s totally an “I’m not so bad” kind of photo. My friend Judson sent me this book. He had no way of knowing that I’d only recently come extremely close to buying one myself. 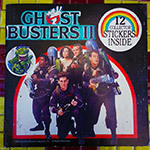 At that Monster-Mania convention back in August, I had my eye on a copy. By the time I convinced myself to pay whatever bloated price the dealer was asking, somebody else had already bought it. The experience gave me nightmares, and not the cool NOES kind. Thank you, Judson. I’m going to sleep a lot easier now. I haven’t read it yet, and I have no clue what it’s about. I only wanted it because it has THE GREATEST COVER IN BOOK HISTORY. Look at it! It’s three-dimensional AND die-cut! 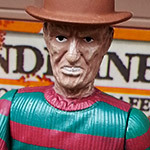 If I’m not mistaken, Freddy’s look was inspired by New Nightmare, which, in terms of fashion, was the perfect blend of Fred Krueger and Jack Napier. 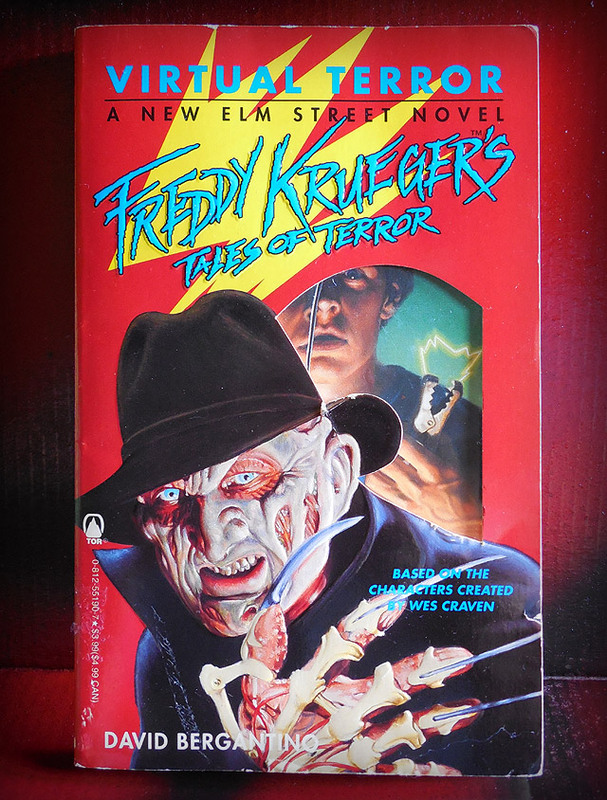 Judging by the synopsis on the back cover, I’m not entirely sure that Freddy Krueger is even in this book. It may just be a “random horror story” blessed with Freddy’s branding. I’m not bothered by this. I don’t care if it’s a book about dendrology, so long as it has THAT COVER. The sixth of the NOES films was also the most maligned. Everything went off the rails in this movie. If you’ve ever heard complaints about how Freddy became “too cheesy,” it’s Freddy’s Dead that caused them. By and large, the NOES movies up to that point had a certain “quality control” about them. The series always did different and better things, and fans loved having that defense in their pockets. Freddy’s Dead, on the other hand, was every bit the unfocused mess that critics said it was. We hated having to agree. Still, time has been kind to it. Movies like this don’t need to be objectively good once they’ve aged. They only need to be entertaining. Freddy’s Dead, for all of its faults, did give us that one scene with the bootleg Power Glove. That counts for something, right? 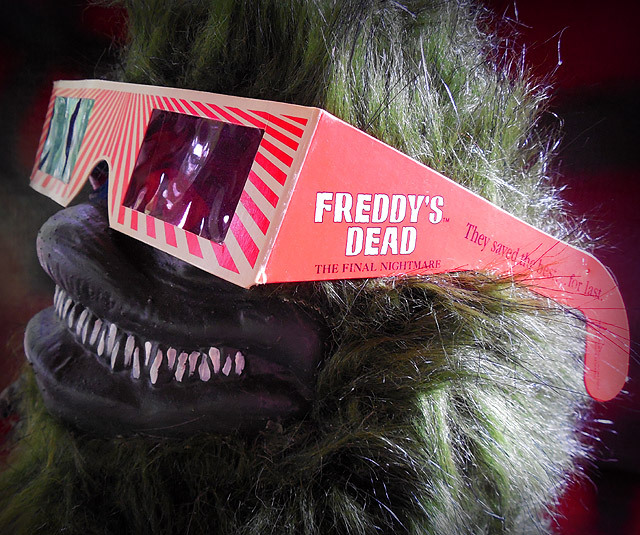 The final portion of the film was in 3-D, and since the glasses given out in theaters had primo NOES branding all over them, it’s no shock that so many people held onto them. From what I’m reading, more than eleven million glasses were given away, making them one of the coolest and most affordable slices of vintage Krueger merch available today. If you’re paying more than five bucks for a pair, you’re paying too much. 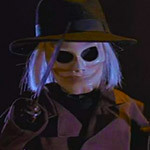 Freddy Krueger’s likeness was very often stolen. There are all sorts of bootlegs out there, from figures to costumes and beyond. Most of that merchandise was made and sold overseas, but this one eked by in the States by being less an infringement and more a “parody.” Meet Eddie Chewger! Made by Zeebs, the “BHS Video Gum” collection consisted of big wads of gum shaped like videocassettes, tossed in plastic boxes shaped like videocassettes, wrapped in additional boxes that evoked videocassette cases. Got all that? 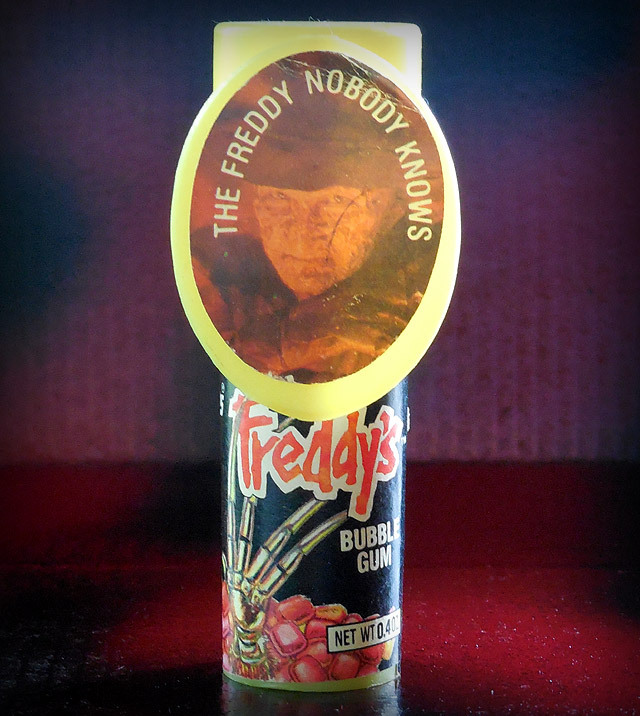 Best of all is the image of Freddy, modified to look like’s made from bubble gum instead of burned flesh. The package is undated (I’m guessing it’s from the early ‘90s), and it doesn’t need the distinction of being “official” merchandise to be one of my favorite-ever Krueger collectibles. 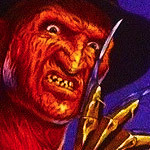 Thanks for reading about Freddy Krueger! And Eddie Chewger! New to the site? I’ve written a lot. The easiest way to see it all is on the Archives Page. Good luck. It’s ten miles long. You can also keep up with Dino Drac on Facebook and/or Twitter! Obscure Nightmare on Elm Street Playset. 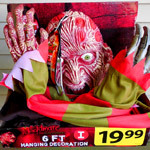 Six Foot Freddy Krueger Decoration! 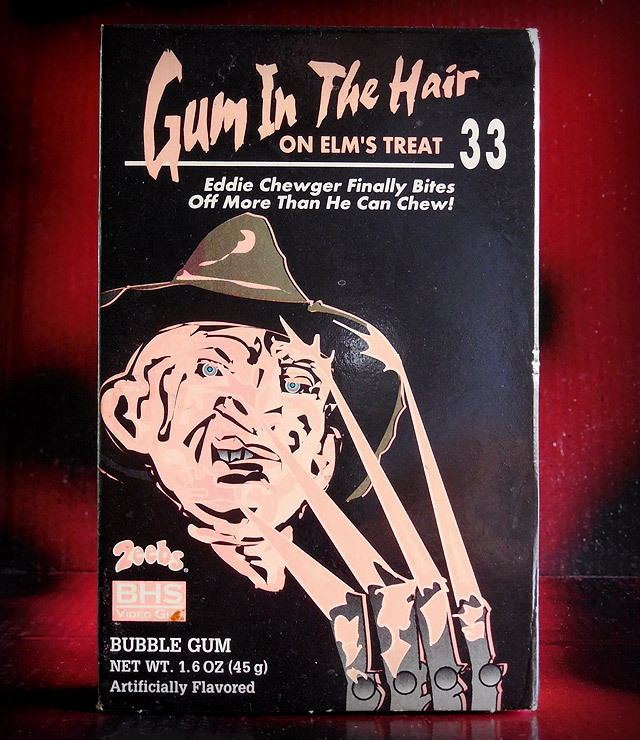 eBay Dig #13: A Nightmare on Elm Street!